One of Beauregard’s Columbiads recovered from the ocean floor? I’ve written some in the past about the remarkable find of the steamer Philadelphia. (And note, this is not the gunboat USS Philadelphia which plied the waters around Charleston during the war.) Some time after the Civil War the steamer left Charleston with a load of scrap metal, including several heavy artillery pieces of Confederate vintage. The Philadelphia never made it out of South Carolina waters and sank off the coast. Recently Rufus Perdue discovered the wreck and began recovery of some 25 cannons (!). Mr. Rufus Perdue was fishing for grouper off the coast of McClennanville when he discovered the sunken USS Philadelphia. The ship sank under the weight of cannons decommissioned from Charleston after the Civil War, being transported north. Mr. Perdue unearthed those cannons, which he now proudly displays outside his Murrells Inlet home. The four digit number on the muzzle stands out in white. Is that 1676? 1678? 1873? 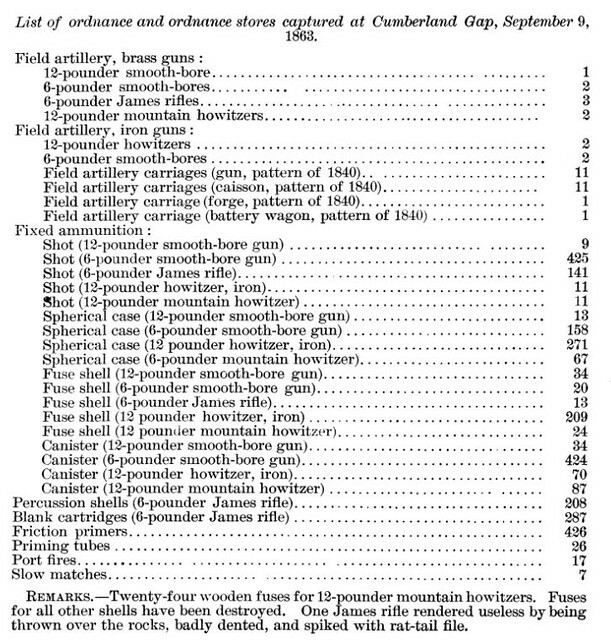 Any of those numbers match the Tredegar Gun Book entries for 10-inch columbiads. 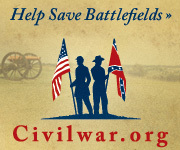 The first two are of interest to the discussion of Charleston’s defenses in March 1863. Foundry numbers 1676 and 1678 appear on a receipt list from November 1862. According to the receipt, number 1676 was sent to Cumberland Gap (yes, up in the mountains). I’ll have to research a bit to determine if the gun ever got there, and if not where it was redirected. But number 1678, paired with 1681, were bound for Charleston. Keep in mind this table from the Charleston board, which shows three 10-inch columbiads delivered to the First Military District in November of that year. The J.R. Anderson receipt accounts for all three of the November columbiads – number 1672 delivered by the foundry on November 5 along with the two mentioned above. 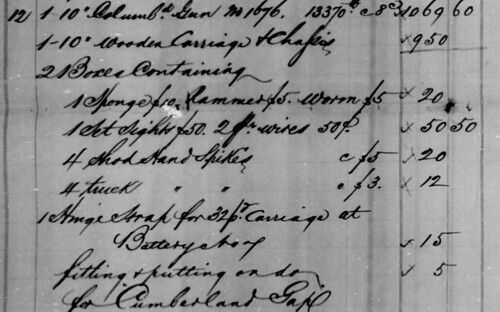 The receipt also accounts for 10-inch columbiad number 1687 delivered at Richmond in the last days of the month, the forwarded to Charleston in December. But… if the number is 1873, then it was cast in July 1863 and was a later arrival at Charleston. Either way, the recovered columbiad was likely a participant in the long siege of Charleston. BELL COUNTY, Ky. (WYMT) – Officials say vandals are damaging historical artifacts used in the Civil War that are on display at the Cumberland Gap National Historical Park. Park Rangers are now using surveillance cameras to catch those responsible. 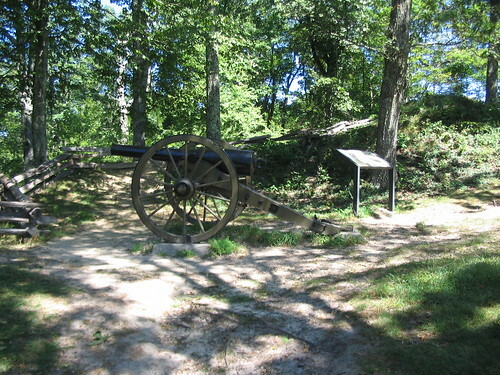 The cannon on top of the Pinnacle in the Cumberland Gap National Historical Park is part of history. “The gun tube itself was used in the Civil War. We’re talking a real artifact here, not just some decoration,” said Chief Ranger Dirk Wiley. Chief Ranger Wiley says some people are vandalizing the part of history. People are carving initials, names, even profanity into it. “These are tangible links to our past and it’s very disrespectful to do that to all the soldiers who lost their lives in this conflict,” said Martha Wiley, the Park Historian. To catch those responsible, Park Rangers set up surveillance cameras. Chief Ranger Wiley says they have already caught five people on video. All face federal charges. 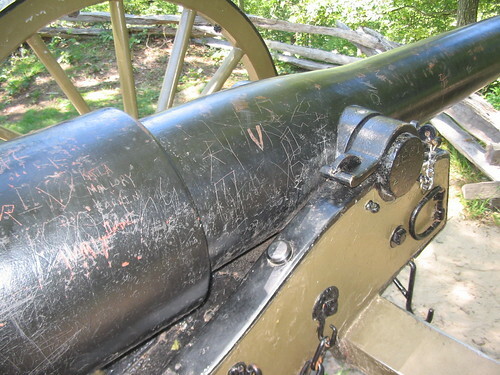 “We do get tired of people vandalizing the cannon and there comes a point you have to do something about it,” Chief Ranger Wiley said. “These are parts of our history and it does make me very angry to see people just be so casual and just desecrate,” said Martha Wiley. Officials say this not only damages historical artifacts, they also have to spend money to clean it up. “In a time when everybody is concerned about the federal budget, where’s our federal money going and where’s it wasted? 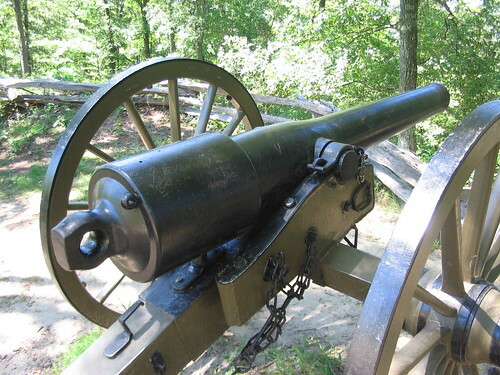 I can’t think of a bigger waste of time than law enforcement rangers having to constantly keep an eye on the cannons and maintenance workers having to constantly re-paint the cannons,” said Chief Ranger Wiley. In the court cases, the park is seeking restitution from the accused vandals. Those convicted could also be ordered to pay fines. I echo Ranger Wiley’s comments, but would go one further. There are some extant earthworks up on Cumberland Gap too. The park shouldn’t have to take extra measures to protect them. Visitors should have the good sense to respect them. The enemy evacuated this American Gibraltar this morning at 10 o’clock, and De Courcy’s brigade took possession at 3 this afternoon. The enemy destroyed a considerable amount of his stores, and precipitated several cannon over the cliffs, spiking others, and carried a few away. I believe, however, that seven have been found in position. The tents were left standing, but cut into slits. He had not time to destroy or take a portion of his stores, and they have been taken possession of by the proper officers. The Stars and Stripes were raised by De Courcy, and a national salute was fired in honor of the capture of this stronghold of treason. Each brigade, in the order of its arrival, will on successive days plant its flag at sunset upon the pinnacle of the mountain, accompanied by a national salute. 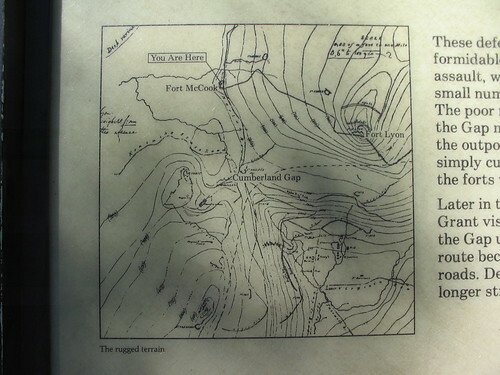 The capture of Cumberland Gap, at least on the map, secured the last corner of Kentucky. The move opened the door, long called for from Washington, to the east Tennessee and west North Carolina unionists. It also opened doors into southwest Virginia. The gap figured prominently in the American mind of the 1800s. The Civil War generation was not far removed from those who passed through the gap on the Wilderness Road. Planting the Stars-and-Stripes at the Cumberland Gap was a symbolic victory – setting the link that bound east and west. But this was not the end of Civil War activity at Cumberland Gap. It would change hands a couple more times with the ebb and flow of the war. 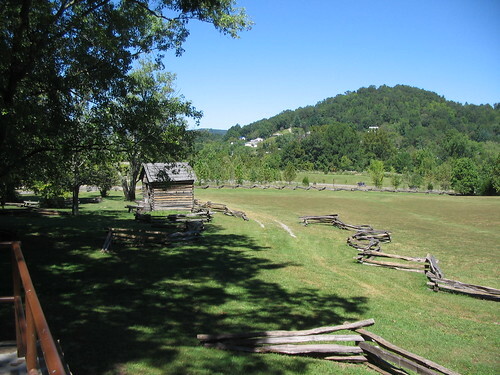 Another of our stops during the recent vacation was Cumberland Gap National Historical Park. While the park’s interpretation is largely focused on the story of migration and settlement, there are a few sites for those with Civil War interests. Pinnacle road provides access into the saddle of the gap and up to Pinnacle Overlook. Along the route are pull-offs to view restored sections of the Wilderness Road and Fort McCook. Rifled 6-pdr Field Gun, produced by Marshall & Company in 1861, stands guard over remains of Fort McCook. The view of Middlesboro is impressive (offering a view of the crater of an ancient meteorite strike). But the works have suffered from exposure, time, and footsteps (unfortunately). 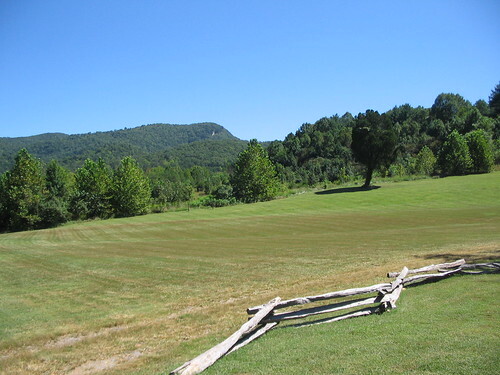 The marker there provides a map indicating the locations of other works defending Cumberland Gap during the Civil War. Fort McCook covered the western approaches to the Gap. A little further up, and on the right side of the map, is Fort Lyon. Fort Lyon overlooked the eastern approaches and the saddle of the Gap. Fort Lyon is better preserved of the two positions and boasts a 20-pdr Parrott Navy Rifle. The park offers an extensive and attractive trail system. A few sources mention additional earthworks on the other ridge lines around the gap. Unfortunately I did not have time to hike and explore those sites. So I’ll have to plan another visit, before saying for sure if more earthworks still stand in the Gap. 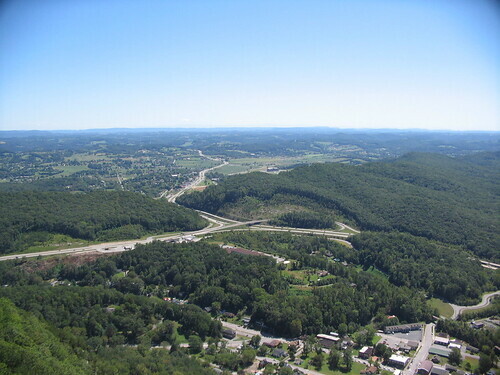 Certainly, the main attractions to Cumberland Gap are the overlooks and the Wilderness Road. And the story of exploration and westward expansion trump the Civil War events. 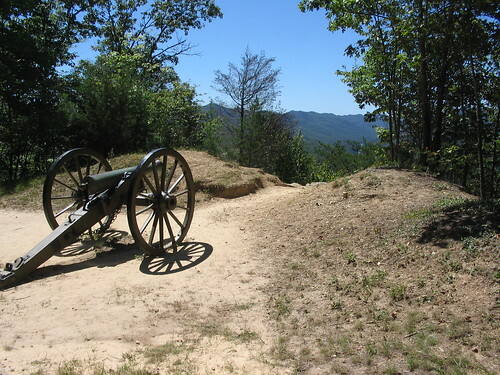 For the battlefield stomper, Cumberland Gap offers a few sites – and a great starting point for explorations into southwestern Virginia, northeastern Tennessee, and western Kentucky.